No prizes for guessing the focus of this show: the stage is a carnival of musical instruments. Over in one corner is a tree of mandolins and banjos, scattered on the backdrop are violins and violas, and in the middle a pianola tinkles away to itself. 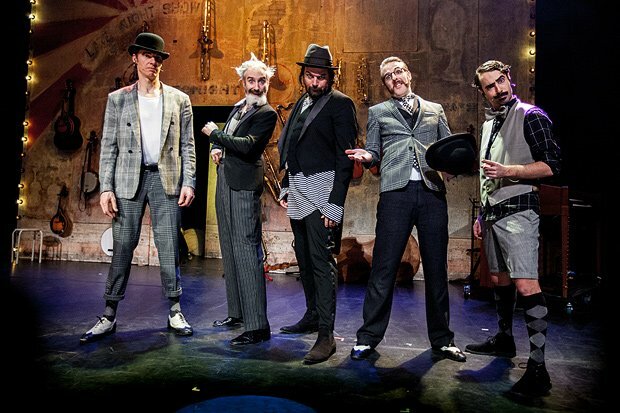 But those are barely half of what this awesomely versatile troupe of slapstick maestros use to serenade us during an hour that is as impressive as it is funny. The five performers from the Netherlands have an eclectic and eccentric hoard of influences, both sharply observed and silly. A motormouthed fairground conman plies his trolley of games between musical numbers, four tramps with shaving-foam noses play bandoneon in lonely harmony, and a battle between Spanish and Italian seduction songs turns gracelessly vicious. It's hard to pinpoint sometimes what alchemy the group has hit on that makes them so funny. Why, for instance, does 'Raindrops Keep Falling on My Head' sung earnestly in German sound so daft? The answer probably lies in the fact that underneath the eponymous slapstick is an enormous amount of musical showmanship and a library of knowledge for pastiching styles and instruments – classical, flamenco, klezmer, swing and indeed, the little known egg-whistle. There is one bum note in the show, when a send-up of an old performer with a shaky hand veers dangerously close to mocking someone with Parkinson's disease. But this feels clumsy rather than malicious. Indeed it would be hard to think ill of these ragtag rogues whom it's clear have huge hearts for entertaining. Assembly George Square Theatre, until 27 Aug, 6pm, £12–£14 (£10). How can you name what is maybe the most sensitive and touching scene the Wereldband has ever made a "bum note" ?